New Delhi, 31st January 2019. Foreign Minister Abdelkader Messahel payed from 31 January to 1 February 2019 an official visit to India at the invitation of his Indian counterpart Sushma Swaraj. H.E. Abdelkader Messahel, Foreign Minister of Algeria was special Emissary of His Excellency Mr. ABdelaziz Boteflika, President of Algeria. He was received by the Indian President H.E. Ram Nath Kovind on 31st January 2019, and handed over to him H.E. Abdelaziz Bouteflika's letter. With his Indian counterpart, they discussed bilateral relations and ways and means of their reinforcement and regional and international issues of common interest including situation in the respective regions of the two countries, De-radicalization & fight against terrorism. 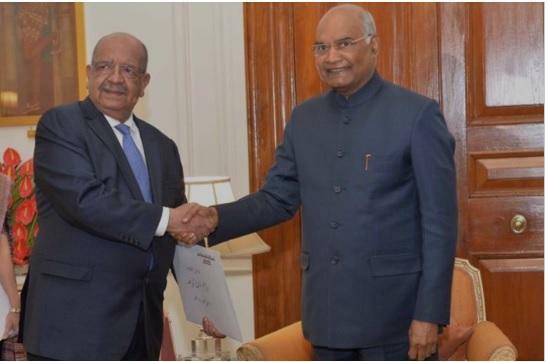 They have proceed also to the signing of bilateral agreements between the two countries, in order to strengthen the legal framework for bilateral cooperation between Algeria and India.